It is early spring, the snow is melting and nature is stirring. The clear, cold morning air feels damp on the skin. A beaver lodge of branches and twigs is clearly visible at the river’s edge; it does not take long before a beaver’s angular profile peeks through the opening. Unaware of the danger waiting on the bank, the beaver swims curiously around a short distance from where the hunter is sitting. Suddenly the silence is broken by a sharp noise. 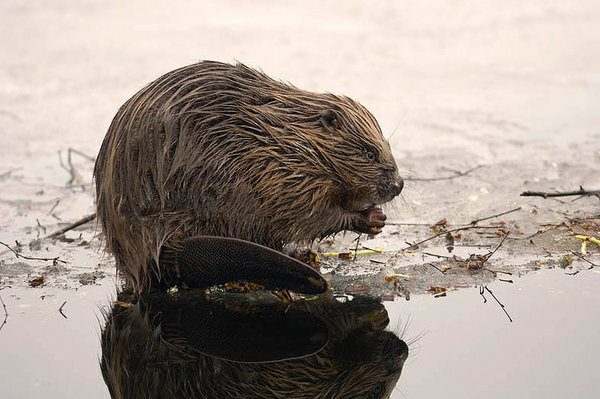 The beaver sounds a warning by slapping its flat tail hard on the surface of the water. In a second it has vanished. Waiting. The sun is rising and the morning mist moves slowly over the water. Soon the beaver appears again and swims towards land.